According to Dr. Nikolas Stihl, in the early days of STIHL the products were colored a dark red. In the early 1970s it was decided that STIHL needed a more modern look and several branding changes were made. One was to change the color to a more dynamic, bright and modern color choosing orange. Other changes included changing the logo and creating a specialized typeface. The orange over grey combination is now a registered trademark of STIHL. extremely quiet and compact, ideal for small lawns and noise-restricted areas. *Marketed for professional use only. All STIHL products are warranted for 3 months when product is used for rental purposes. 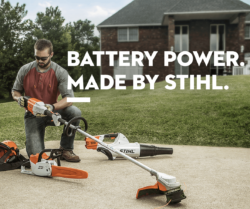 STIHL HP Ultra Oil and STIHL MotoMix® premixed fuel provide for improved engine longevity.